What is it that causes so much anger against Brown Pelicans? This week 11 young pelicans were found with their wings intentionally broken along an Orange County beach in Southern California. Only one pelican has survived. There’s now a $5,000 reward for information leading to an arrest. Local wildlife officials say the attacks appear to be intentional. 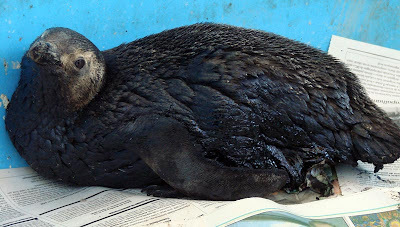 Lisa Birkle, assistant wildlife director at the Wetlands and Wildlife Care Center, said the injuries were consistent: “Someone is snapping the wings backward.” She said local residents noticed fishing boats close to shore where pelicans also feed. Pelicans have been a target of cruel and unusual acts. Each year IBRRC bird center wildlife clinics treat pelicans with slashed pouches and other injuries that appear to be intentional. 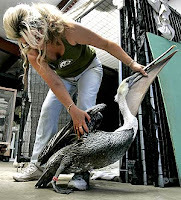 In 2003, IBRRC received mutilated pelicans that showed up at Cabrillo Beach near San Pedro. The California Brown Pelican is still protected by the Endangered Species Act. 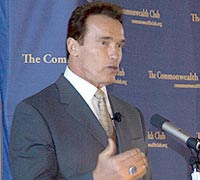 Anyone with information relating to these incidents is encouraged to contact Special Agent Ed Newcomer of U.S. Fish and Wildlife at (310) 328-1516. If you can make a donation to help all pelicans that come into the rescue center, go to the Wetlands and Wildlife Care Center’s website. To add to the reward money, please call IBRRC at (310) 514-2573. Trash on the beach got you down? Want to make a difference? 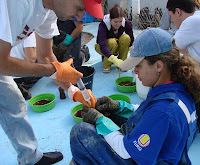 Participate in the Coastal Cleanup Day this Saturday, September 20, 2008. 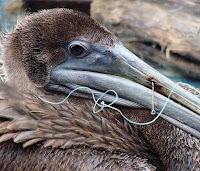 Beach debris causes major problems for all animals, including discarded fishing tackle that harms birds and mammals. 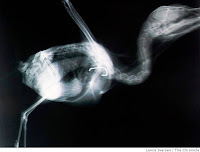 See x-ray of duck (above) with injested fish hook. More info: Call 1 (800) COAST-4U or visit http://www.coast4u.org for more information. A new program beginning in New England hopes to turn discarded fishing tackle and ocean debris into electricity. 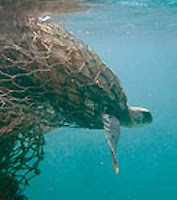 The “Fishing for Energy,” is an effort to work with coastal communities to reduce the amount of abandoned fishing gear that ends up in the nation’s oceans. 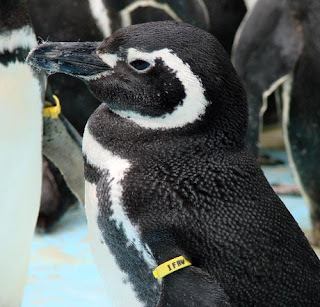 It’s a joint project with Covanta Energy, National Oceanic and Atmospheric Administration (NOAA) Marine Debris Program and the National Fish and Wildlife Foundation. The gear is collected and burned to generate power at a nearby Covanta incinerator. According to the company, the power plant is outfitted with emission control scrubbers that remove pollutants that might be released into the atmosphere from the burning of plastics and toxins in fishing debris. Each year thousands of pounds of discarded fishing tackle affects the marine environment. At IBRRC we continue to see increasing numbers of birds – especially endangered Brown Pelicans – injured by fishing line, nets and hooks. See: Tangled in trash. The brown pelican named “Gigi” that landed and halted traffic in August on the Golden Gate Bridge was released released back to the wild on Friday, September 12. The young bird was rescued and transferred to International Bird Rescue where it has been recuperating for the past several weeks. This female brown pelican also had the unique fortune of capturing the attention of filmmaker Judy Irving of Pelican Media, who successfully documented “The Wild Parrots of Telegraph Hill.” Irving has decided to include this special bird in her latest project on the life of pelicans. She also filmed the release of Gigi (as in “Golden Gate”) along with a handful of other pelicans nursed back to health at IBR’s San Francisco Bay-Delta Wildlife Center. The Golden Gate pelican (aka P193) and company was released Friday and all went beautifully! Nancy and Jerry Mix and myself were happily surprised when we pulled up and saw a crowd of people from the Discovery Museum, the two folks that have the little red firetruck and do SF tours, the SF police, the staff from the Golden Gate bridge, and others at the release site at Fort Baker. 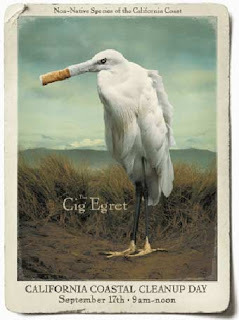 Everybody was really jazzed to see these truly incredible birds leave their carriers (“GG” was last, of her own accord! 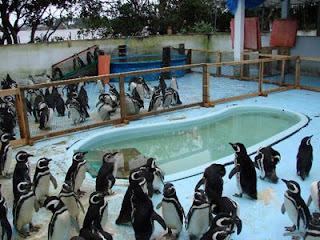 ), swim en masse in front of everyone before flying in a large circle in front of us and then off into the sunset. The kids cheered and the folks that rescued her actively participated and they couldn’t stop smiling. Two of them drove in SPECIAL to be there. It was a really wonderful experience for all of us. Judy Irving filmed every aspect of the release, as she has been filming all of “GG’s” journey for her new short film on pelicans. Some of you have likely seen her hanging around the center with her camera and gear. She is the filmmaker who made “The Wild Parrots of Telegraph Hill”. This was a great opportunity to do some community outreach and the feedback has been really positive and wonderful.